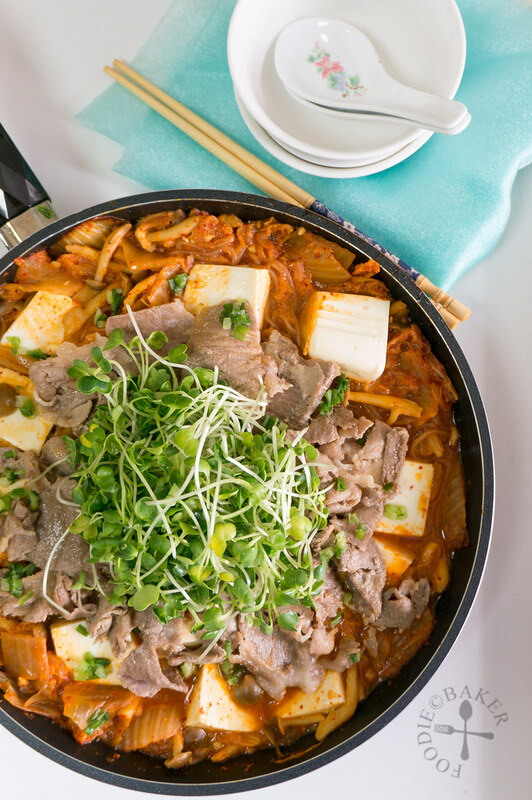 I’ve often seen restaurants in Singapore offering Budae Jjigae in their menu and often wondered what it is about – it seemed so popular and many people like to order it. 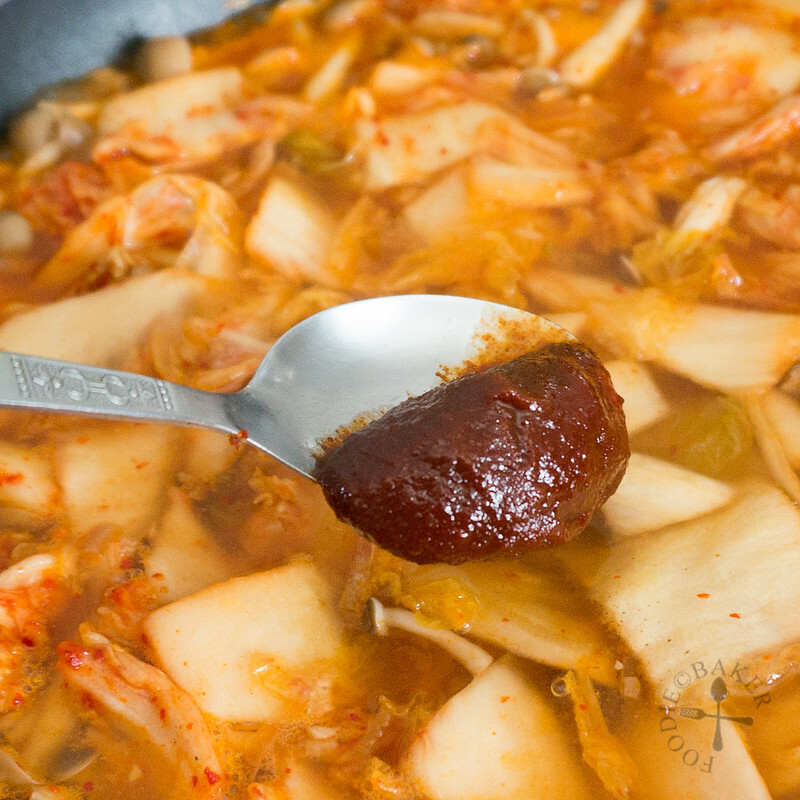 Upon Googling, I found that Budae Jjigae translates to Army Stew and is a type of jjigae (which means “stew” in Korean), made with lots of unhealthy ingredients like hot dog, Spam, ham, baked beans and instant noodles etc. in a spicy soup base. I do enjoy an occasional hot dog, Spam, ham, baked beans and even instant noodles, but to combine them together and serve as a meal? It’s just too horrifying for me. So I embarked on a hunt for a healthier and even more yummy jjigae. And I decided to combine Budae Jjigae and Kimchi Jjigae together, swapping out the unhealthy ingredients with more healthy ones. The soup base I used is a dried anchovy soup base, made with our local Singapore ikan bilis. Ikan bilis are full of nutrients and a little goes a long way – a small handful packs a very powerful punch of flavour. You can use the Korean varieties if you prefer. The soup base will then be flavoured with kimchi and gochujang. Gochujang is a Korean hot pepper paste which is needed to bring out the flavours and heat of this dish. 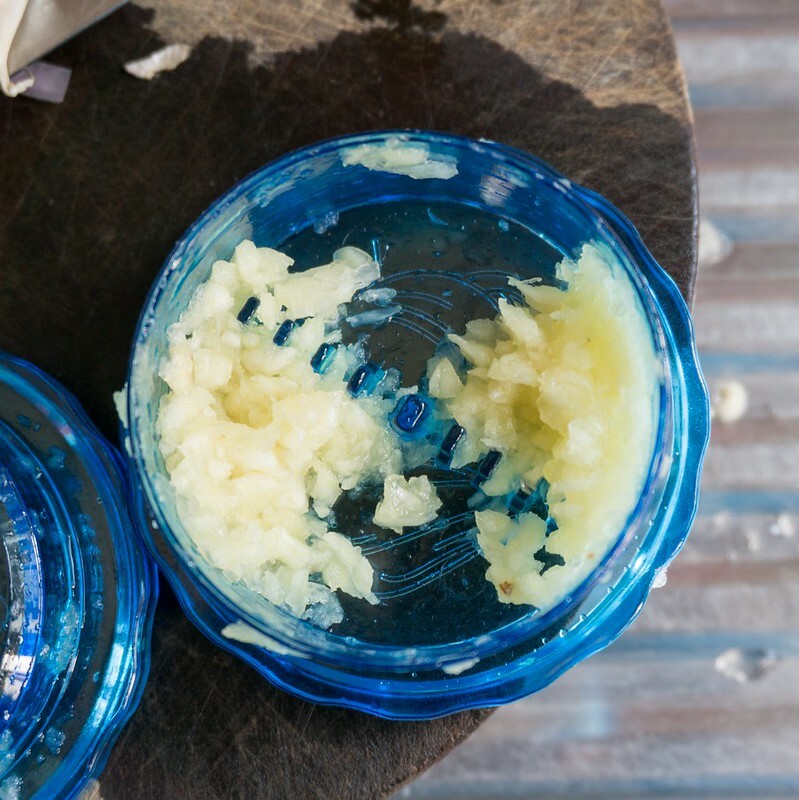 It’s very hard to find a substitute for this, but I’ve managed to find a blog which tells how to make it from scratch, just in case you need it! The vegetables I used are onion, garlic, mushrooms, kimchi and tofu. You can add spring onions, chili, carrot and all sorts of vegetables! 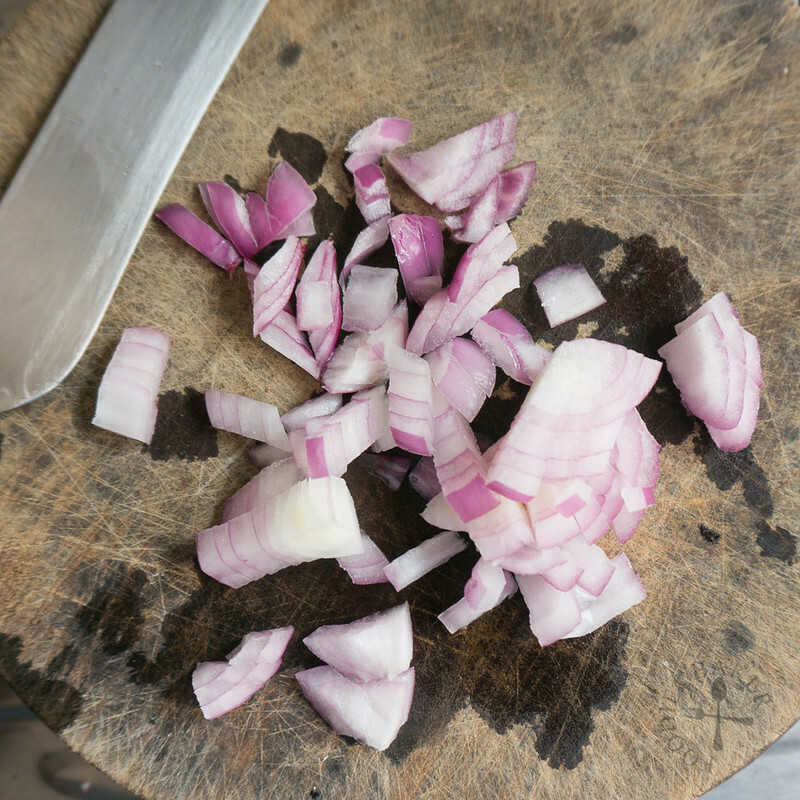 Onion and garlic are the usual suspects in most cooking, as they give flavour to the dish. 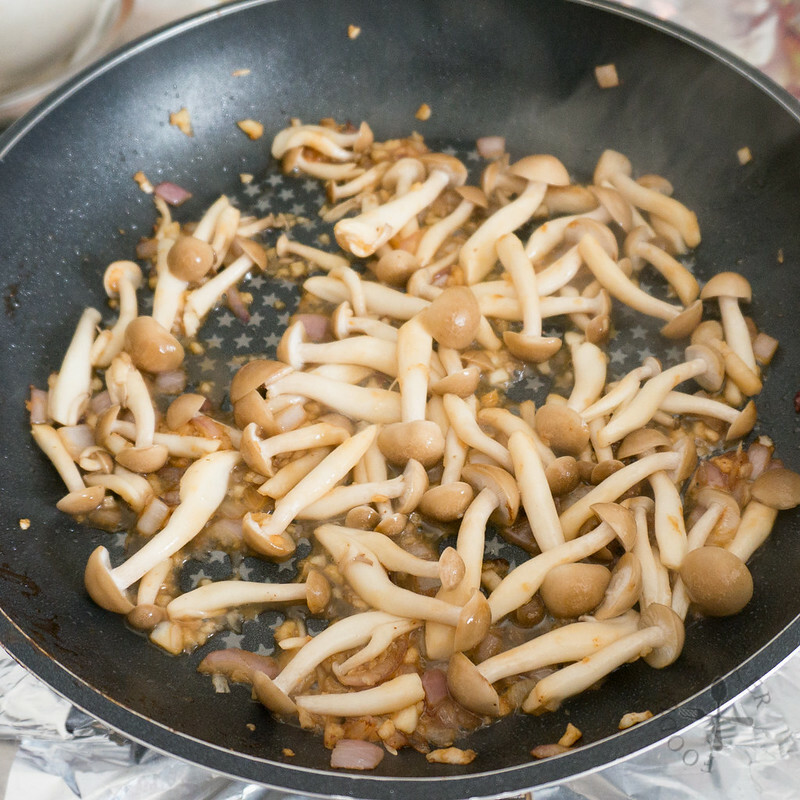 Mushrooms are added for some chewiness and you can use any kind of mushrooms – I highly recommend fresh shiitake, shimeji and enokitake as these Asian mushroom flavours will blend well with the overall dish. 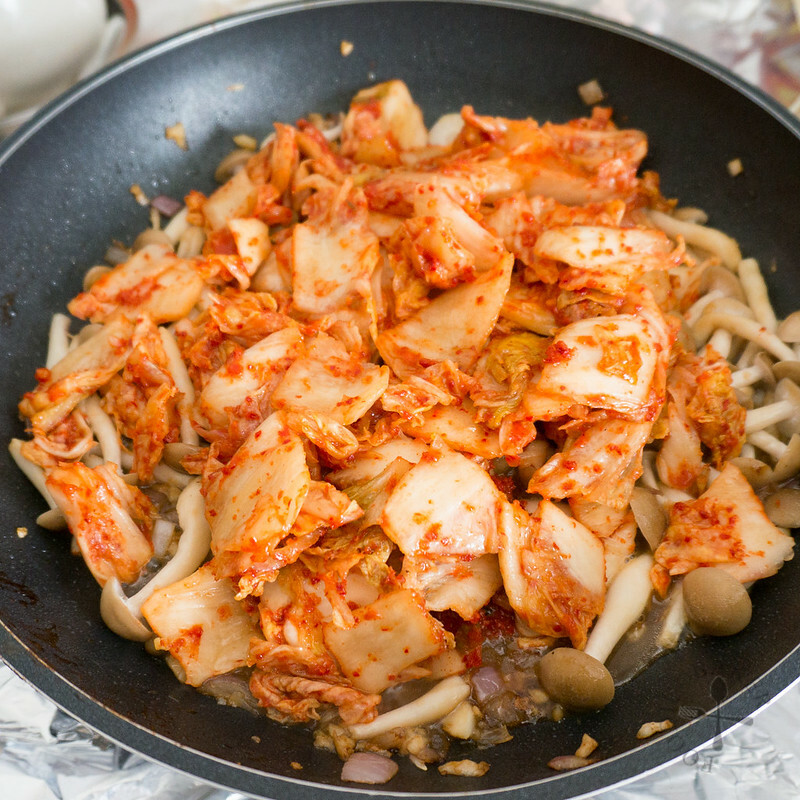 Since it is a Budae-Kimchi fusion, kimchi is a must! I used Napa cabbage kimchi as it’s the most common here in Singapore. 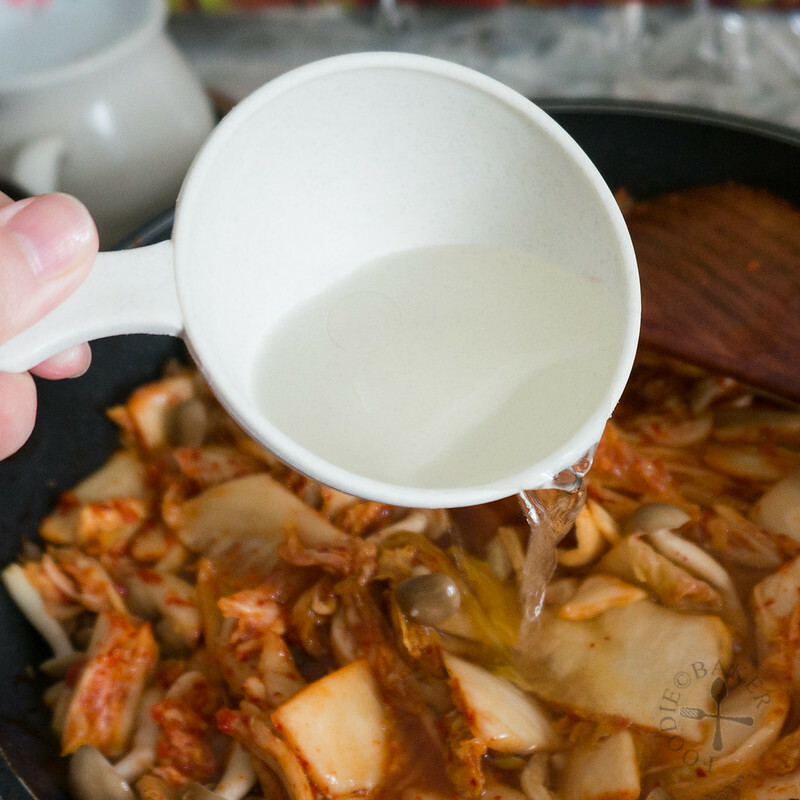 If you can’t find any, use fresh Napa cabbage, but be prepared to add more gochujang and a longer cooking time to soften the cabbage. Can’t really say tofu is a vegetable, but I don’t have anywhere to lump it, so here it goes! I used silken tofu as I really love its texture. Add the tofu only towards the end so you won’t break them up as much as you stir the dish. I garnished the dish with radish sprout the first time – but the radish sprouts have a hint of bitterness in them, so if you don’t like them, omit it! 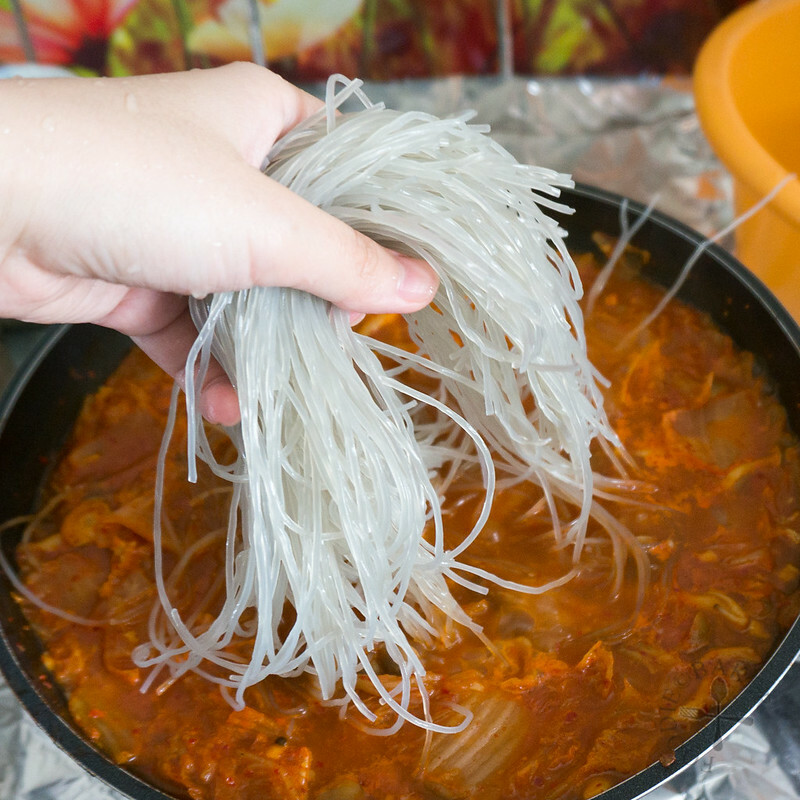 Instead of ramyeon (instant noodles in Korean), I used sweet potato noodles, which is known as dangmyeon in Korean. It is often used in Jjapchae, a stir-fried noodle dish with meat slices and vegetables. I love the texture of this noodle and it soaks up the flavours wonderfully. 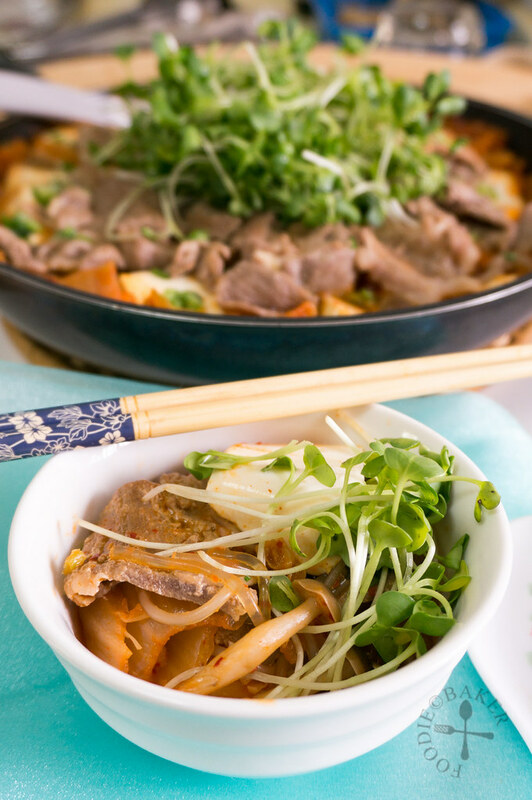 You can use lesser noodles or omit them and serve the jjigae with rice, or add more noodles and omit the rice – but be prepared to add more stock as the noodles will absorb the soup. I threw out the idea of using ham, Spam, sausages, bacon and any other kind of salty, processed meat. 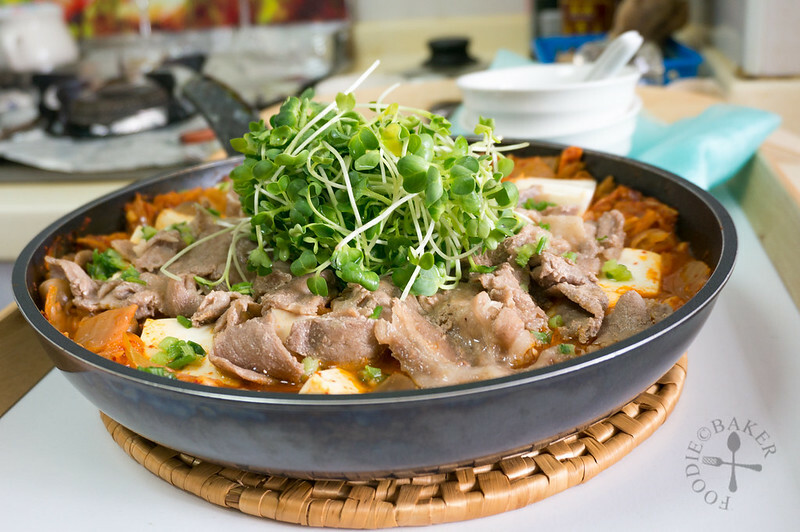 In Korea, they like to use a strip of pork belly in their jjigae but because additional time will be needed to cook the pork belly, I decided against it as well. I ended up using thinly sliced pork collar, the kind we usually use for steamboat. It’s nice and thin, and cooks really fast. The first time I made this fusion jjigae, I seasoned the meat and sauté the meat first, before arranging it on top of the jjigae. For the second attempt, I simply added the raw pork slices into the stew, and they tasted the same – so I skipped this step in my final recipe below. 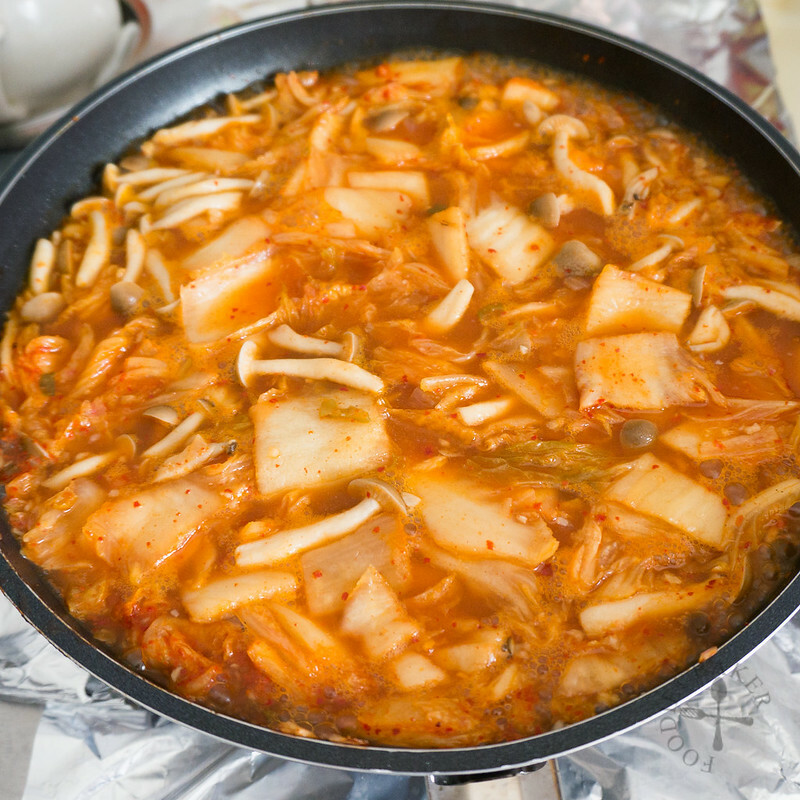 Now are you convinced that my fusion of Budae-Kimchi jjigae is better than those sold in restaurants out there? Try it yourself and let me know! 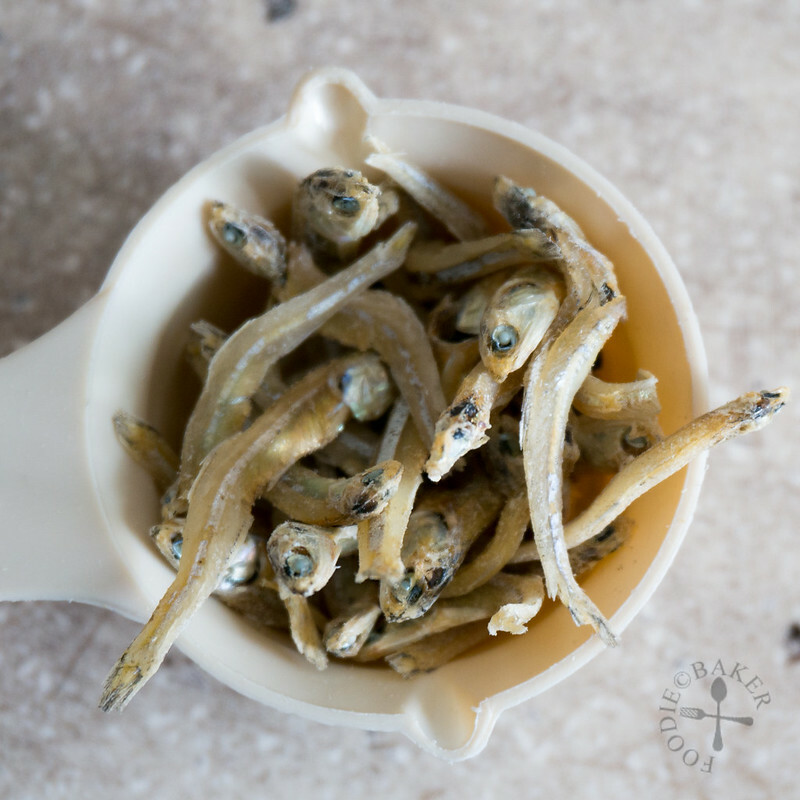 1) Grab a small handful of anchovies and rinse under water to get rid of excess salt. 2) Add into a pot of water and bring to a boil. Simmer for 20 to 30 minutes then strain and discard the anchovies. 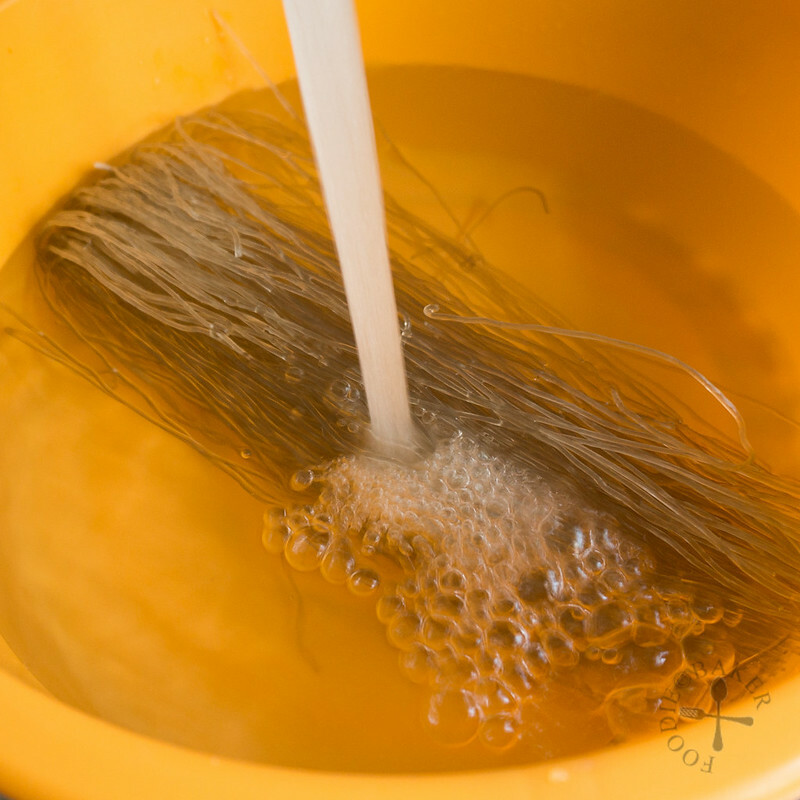 3) Add water to sweet potato noodles to soften them. 4) Dice an onion (I only had 1/2 an onion when I cook mine). 5) Mince the garlic. 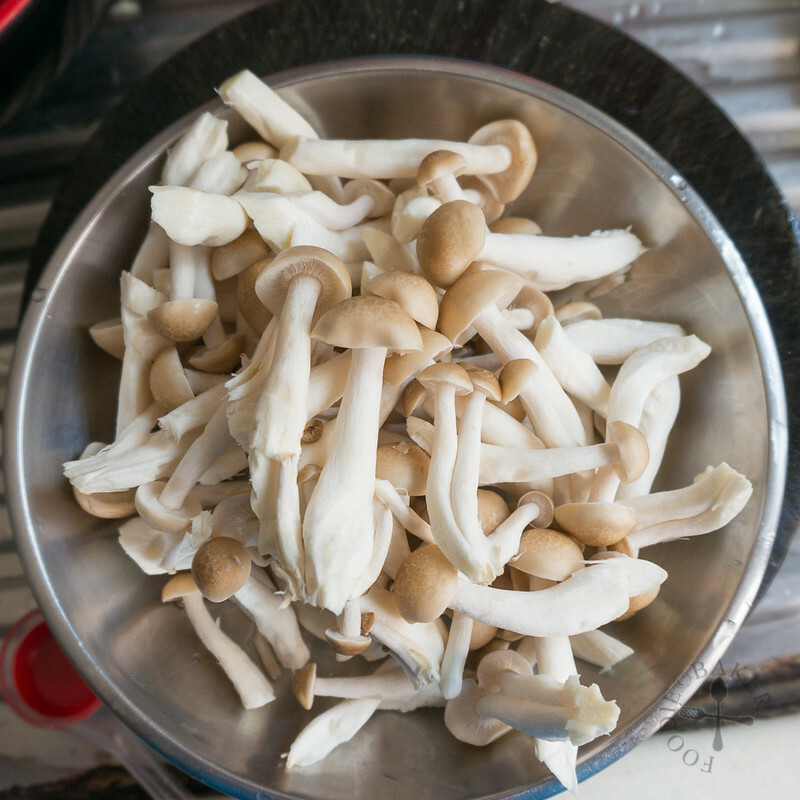 6) Remove the roots and separate the mushrooms into small bunches. 7) Slice the tofu. 8) Rinse the radish sprouts. And now you are ready to cook! 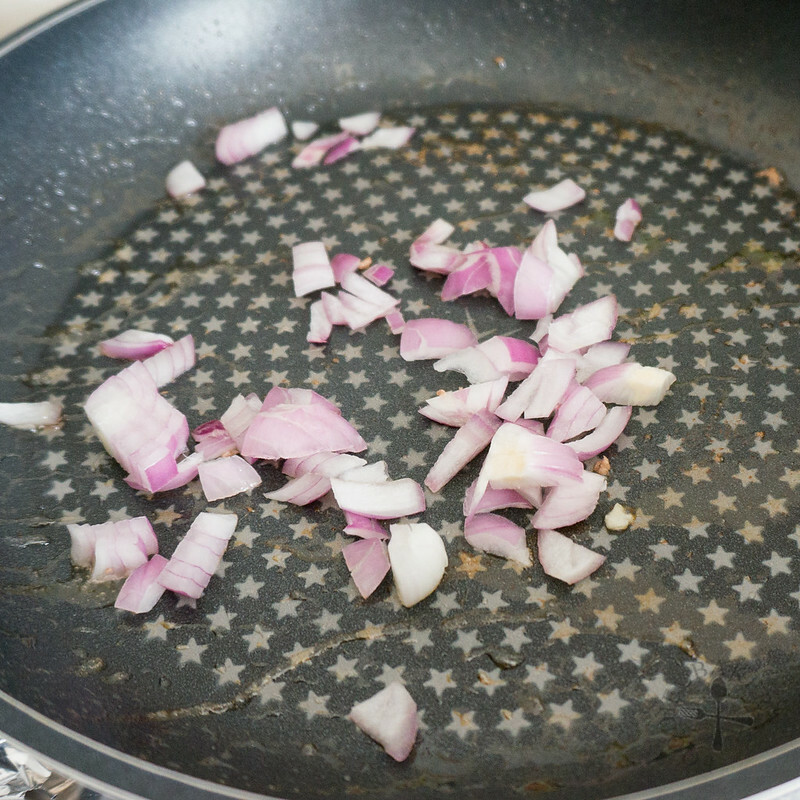 9) Sauté the onion in a little oil until onion is translucent. 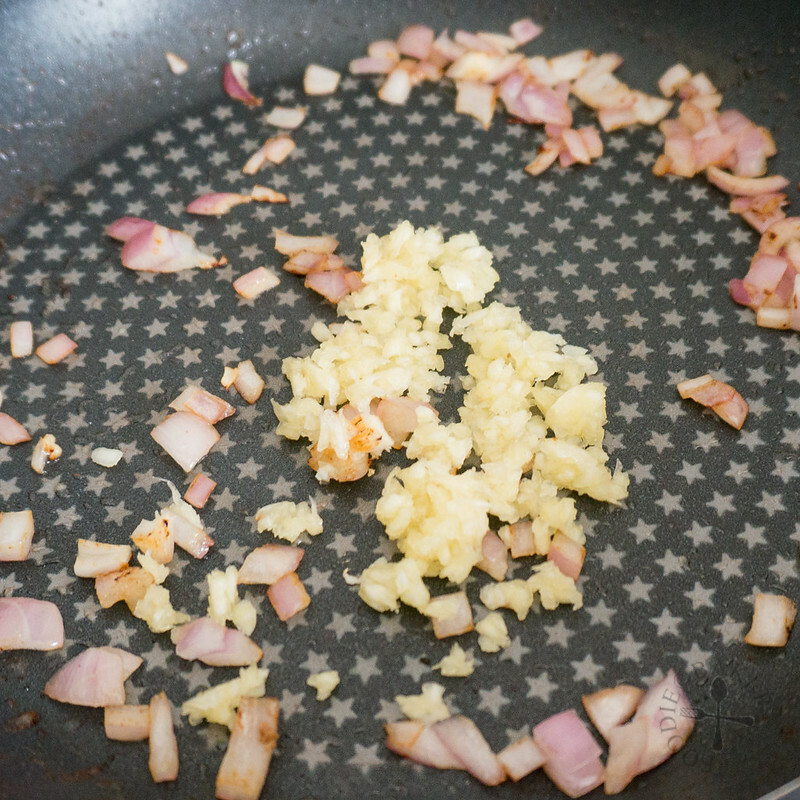 10) Add in the garlic and sauté until garlic is fragrant. 11) Add in the mushrooms. 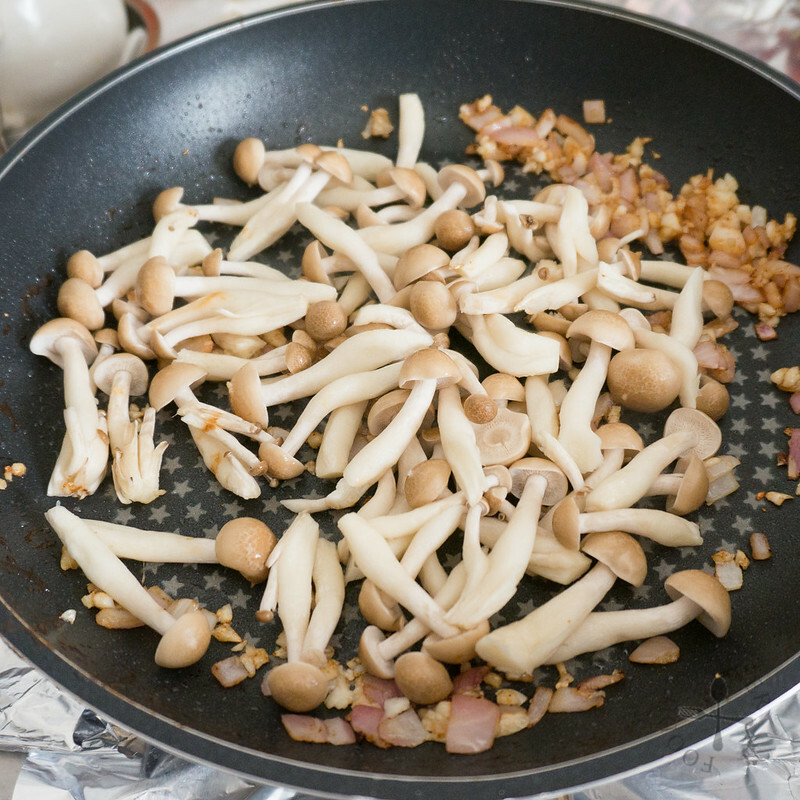 12) Stir-fry until the mushrooms have shrunk in size. 13) Add in the kimchi and stir-fry for a few minutes. 14) Pour in most of the anchovy stock. 15) And add in the gochujang. 16) Bring to a boil and lower the heat down to a simmer. 17) Stir in the potato noodles and the pork slices. 18) Arrange the tofu and heat through. Garnish with radish sprouts and serve! 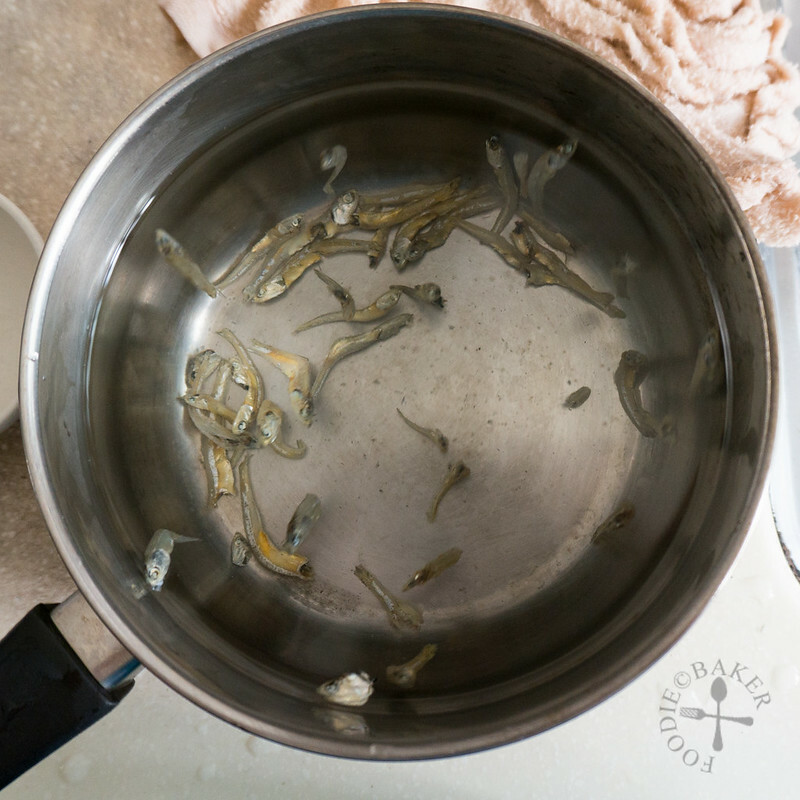 Rinse the dried ikan bilis with cold water and place it in a pot. Pour in the 5 cups of water and bring to a boil. Turn down the heat and cover the pot with a lid. Simmer, covered, for 20 to 30 minutes. Strain the stock and discard the ikan bilis. Set the stock aside. Place the potato noodles in a large bowl and add in enough water to cover the noodles (I used tap water at room temperature). Set aside for at least 30 minutes until softened. Drain and set the noodles aside. Heat oil in a large frying pan or a large pot over medium heat. Add in the onion and sauté until translucent. Add in the garlic and sauté until fragrant. Add in the mushrooms and sauté until the mushrooms have browned and shrunk in size. Add in the kimchi and stir-fry for several minutes. Add in the kimchi juices (if any), 3½ cups of stock and gochujang. Bring to a boil and simmer for 15 minutes. Add in the drained potato noodles and pork slices and stir them in. 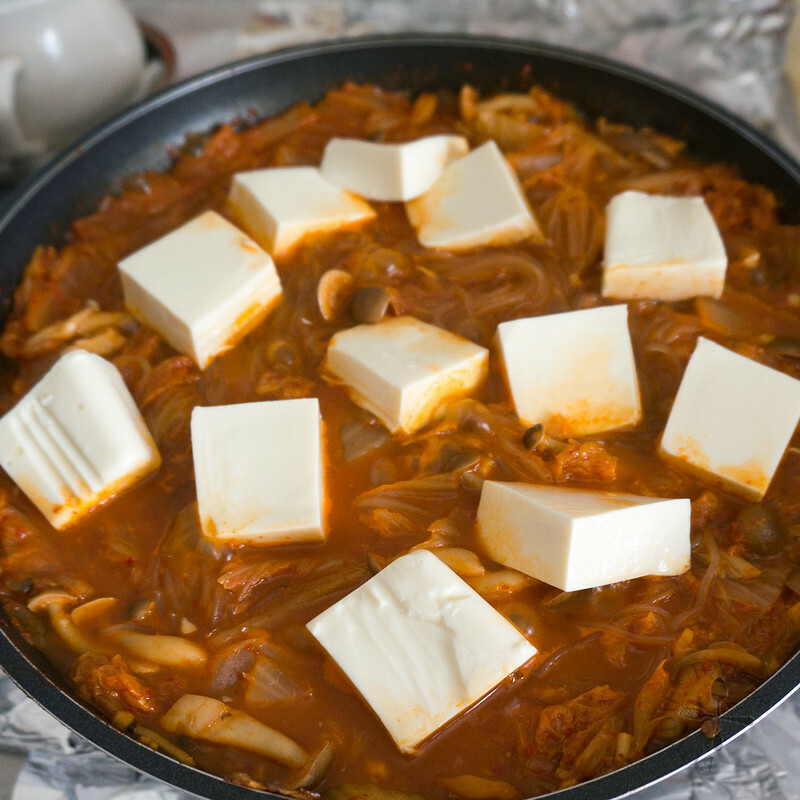 Arrange the tofu on top and simmer for 5 minutes until the pork is cooked and the tofu is heated through. Add in more stock if needed and drizzle in the sesame oil. 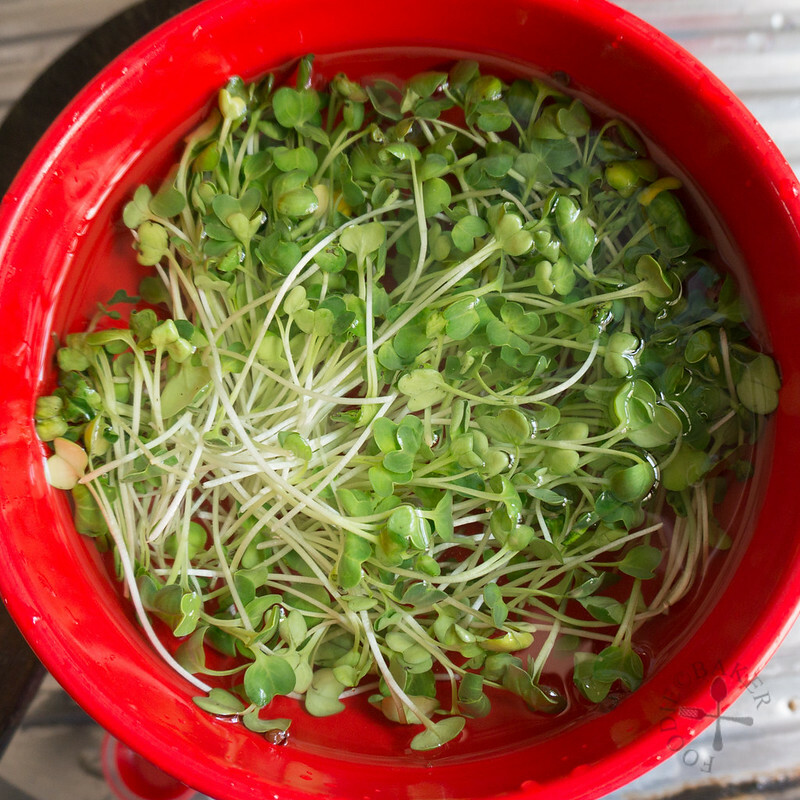 Arrange the radish sprouts on top and serve with rice. Thank God for your recipe. The reason I have never tried to make this dish at home is indeed the “horrifying” combination of spam, hot dog and instant noodles in one single meal, which will undoubtedly bust an entire year worth of my self-imposed quota of unhealthy food. I might just keep the noodles though. :p Can’t wait to try it! You are most welcome Kate! Yes… just having the spam-hotdog-ramen combo as one meal is simply too unhealthy, but having only one of them in it sounds like a much better idea! Let me know how it goes! 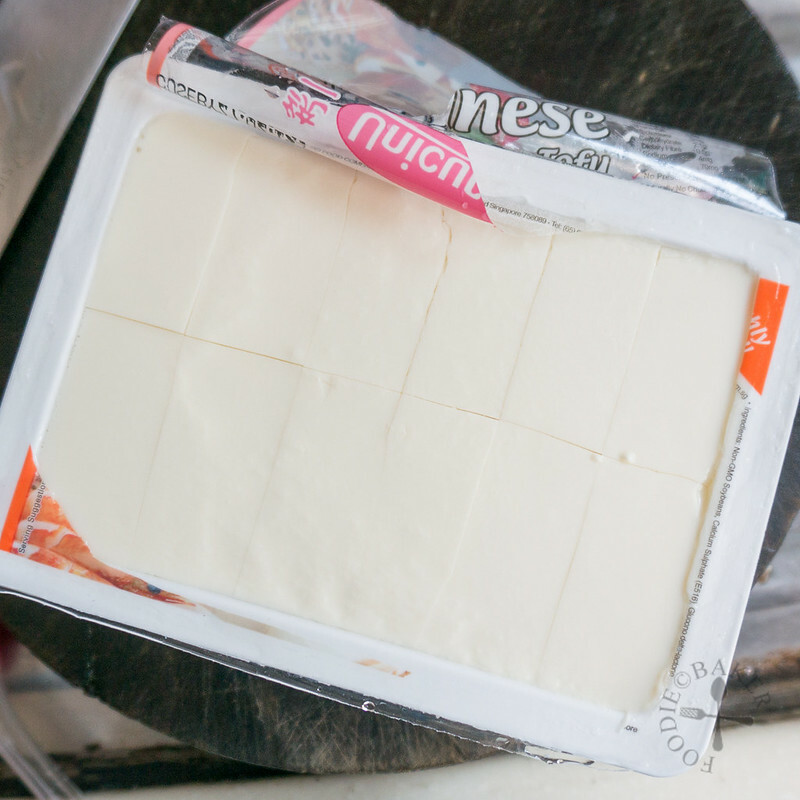 You have make cooking this luxurious dish looking so easy like magic! Thanks for the compliment Zoe! This is the first time I have heard of this dish. I really like your healthy adaptations and I love radish sprouts! Looks so cozy and warm during this strange hot one day and cold the next day weather we are having here in HK. Are you unpacked? Awesome dish! Looks very appetising and beautiful presentation too. Thanks Veronica! Hope you get to try this dish soon! Thats an incredible dish, I like yours much better than the traditional Jjigae. Have to admit it does sound interesting though.